Superboy marked an historic return to live-action television for the Man of Steel when the show premiered October 3, 1988. It had been more than 30 years since the cameras rolled on "All That Glitters," the last episode of Adventures of Superman and like its historic predecessor, this new show was also a half-hour first-run syndicated action/adventure series featuring the latest in special effects and a varied assortment of guest stars. Totaling 104 episodes when production ended in late 1992, Superboy (retitled The Adventures of Superboy in its third and fourth seasons) was produced in Orlando, Florida - first at Disney/MGM Studios and then at Universal Studios/Florida. A co-production of Viacom and Alexander and Ilya Salkind (creators of the first three Christopher Reeve Superman movies and Supergirl), the show was well-received among television critics and ranked among the top ten Nielson-rated new syndicated programs. The show's first two seasons chronicled Superman's college years at Shuster University's Siegel College of Journalism (a nod to Superman's co-creators, Jerry Siegel and Joe Shuster). The equally fictitious Capitol City was the show's setting in its third and fourth seasons, in which Clark Kent and Lana Lang (Stacy Haiduk) completed their education with internships at the "Bureau for Extranormal Matters." These later episodes were executive produced by Julia Pistor for Lowry Productions. Gerard Christopher, educated at New York's prestigious Julliard School and a veteran of many film and TV appearances, was selected for the coveted role of the young Superman after the departure of first-season lead John Haymes Newton. Over the course of his involvement with the series, Christopher expanded his duties to become a producer and, on two occasions, scriptwriter. His creative influence over Superman's updated television persona, while innovative and original, was greatly inspired by George Reeves and Adventures of Superman, as he explains in this interview with The Adventures Continue contributor Brian McKernan. Was Adventures of Superman on TV in your home when you were growing up? I grew up with Superman and he's a real slice of American culture. When I was a child, George Reeves was the Superman I saw first. My upbringing was similar to that of most people; my mother told me I used to put a towel around my neck and jump off the roof of the garage in our back yard when I was a kid. When I got the role of Superboy I was pretty numbed by it. It's not like doing any other characters. Roles come and go, I worked on Melrose Place recently, but Superman is something that will always linger with me. Because Superman is etched into television history. It's a real piece of American culture. It was a pretty awesome thing to do, to see the effect this character has on kids - on all people - all over the world. It was a little bit scary, but also a lot of fun. I got a lot of participation from fans who sent me the most unbelievable letters and were incredibly knowledgeable about the history of Superman. They told me some of the most obscure things that were just amazing. And it turned into a great experience for me, one that I couldn't have imagined when I started out. It was pretty daunting, just to fit in some way into the whole mold of what's been created in the Superman legend. It was amazing - a fantastic experience. I imagine that there were certain things that people expected to see - such as flying, which you did a lot of. And the reason I did was because of the fan mail. When I read letters the one thing people wanted to see - hands down - was flying. You could punch anything, break through walls, use X-ray vision, use heat vision - just as long as you show flying. Everyone loves it. I looked to the best available examples of Superman in preparing for the role. I'd grown up with George Reeves' series, of course, and I looked at most of the other live-action versions: the Salkind movies, the serials with Kirk Alyn, and even the Superboy pilot done in 1960 with John Rockwell, who's actually a friend of mine. I never even knew he had been an actor until I got the Superboy series. Who particularly stands out among the other actors who have portrayed Superman? Like a lot of people, I have an emotional, sentimental attachment to what George Reeves did. He just seemed to do Superman the right way, the correct way, the way Superman is supposed to be done. I also have a lot of respect for the personality that Christopher Reeve brought to his Superman role. He's a big, tall, handsome guy and he gave the role a new twist and reawakened it. But in terms of sentimentality George Reeves is my favorite. I'd have to say I like them both. So seeing what others had done with your character was part of your research for the role? Yes, but there's something difficult about that, because you can't do what everyone else has done. You have to also make the role your own. That was a difficult thing to do because DC Comics had a very tight hold on us. There were many constraints as to what that character could and couldn't do. It was sometimes very difficult to have any kind of an ease about the character. But it was still a lot of fun. The word I get is that the cast of Lois & Clark: The New Adventures of Superman is having a bit more fun and is able to associate loosely on the set. They have more latitude because Warner Brothers, DC's parent, is overseeing things. Were you involved with the production of Lois & Clark? I actually read for the show. It was interesting. At first the casting director didn't like my interpretation. Then she asked me to change it. I did and she liked it. Then she brought me in to meet the producers. When I walked into the room, they had no advance knowledge that I had done Superboy. Now, there are two ways to look at that: They're either going to love it because I had done the part before, or the opposite would be true - they'd hate it. I read for the producer and his reaction was, "Wow! You're great, it's wonderful, you're the perfect guy for this!" There was a room of six or eight people, it was kind of exciting. Then he grabbed my resume, looked at the work I'd done, flipped it over and said, "You've done this already!" He threw my resume down on the table and basically threw me out of the room. It was pretty funny. You have to keep in mind the situation that the Lois & Clark people were in. It's similar to when a restaurant goes out of business and is taken over by new owners: The new management wants to change the decor, the menu, the colors, the fabrics on the chairs - everything. He could have looked at the new show as an easy transition for me - from Superboy to Superman. I'm older, I'm experienced, and I have a following. But he was making a big move, a big transition in how the character would be interpreted. He wanted to go a different way. People like to do things their own way and often times they cut ties with anything that came before for their own personal reasons. I'm not making any judgements; if that's what he wants to do it's his business. Are there any particular episodes of George Reeves' Adventures of Superman that stick in your mind? I like the ones that are mysterious. "Dagger Island," where he was on a deserted island. And "The Mysterious Cube," where he transmigrates through solid objects - I kind of regret that we didn't use that idea on Superboy. I also like the pilot, "The Unknown People," with the mole men - it's just so weird. It also has Superman dealing with a worldwide issue, as opposed to just rescuing Lois when she's tied to some train tracks. It made me think, when I wrote episodes of Superboy, to created situations that put him in a world arena, not a local one. Here's a guy with all this power - what would he do if... ? "Wish for Armageddon," one of the Superboy episodes you wrote, put him in that world arena, battling a force seeking global destruction. Superboy fills in the gaps of the Man of Steel's college years with a variety of stories that range from gritty crime tales to pure science fiction - similar to Adventures of Superman three decades earlier. "Superboy... Lost" was clearly inspired by Adventures of Superman's "Panic in the Sky," an episode recently remade again as a Lois & Clark installment. Superboy seemed to broaden in scope when you and producer Julia Pistor came on the scene. I owe my undying gratitude to Ilya Salkind for hiring and believing in me. Julia came in with fresh ideas and allowed me to make the changes I wanted to make. When she joined us we started getting some great episodes - we explored some interesting things and we had a lot of fun. Julia is a wonderful person and I can't say enough about her. She's very professional and she did what a producer has to do. The episode "Paranoia" was dark, yet funny, and guest starred Jack Larson and Noel Neill. It was very much an homage to Adventures of Superman, with Larson saying "Jeepers" at one point and making reference to having worked at a newspaper. What was it like to work with them? Right off the top, I have to say that Jack and Noel are a great pleasure to work with, it was really exciting. So many of the people on the Superboy crew grew up with Adventures of Superman that it was very exciting for everybody. We were all in awe of them. Noel Neill is great. I felt that she was very appreciative to be there and that people wanted her. It was nice to work with her, she's a super lady. Jack Larson is a super guy, I can't say enough about him either. He's been personally helpful to me, career-wise, and he's an incredibly nice and generous person. He's got a great sense of humor. Jack kind of looks at the cockeyed side of life sometimes, and always has a laugh under his voice. On the set, Jack was nice enough to say he thought our show was superior to his, which was sweet of him. He also said they never anticipated what a hit Adventures of Superman would be back when he first got involved in it. He did it on a whim, never realizing that he'd get socked into it for seven years. Did Jack Larson and Noel Neill talk about George Reeves? They put the past in perspective in terms of their lives and careers. They just seemed to be having a lot of fun, which I was grateful for. That's part of the deal, having fun when we're working, and Jack added a lot to that. I did talk to Jack about George Reeves. He recalled what a great guy George was. Very upbeat. Obviously, that's the word that's around about George to this very day - what an incredibly generous guy he was. George used to go around putting $100 bills in other actors' hands and telling them, "Now go make a million!" 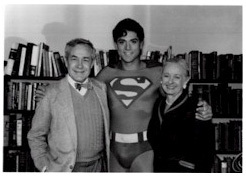 Aside from Jack Larson and Noel Neill, who were the most interesting guest stars you worked with on Superboy? The one that really stands out for me is Ron Ely ("The Road to Hell, Part 2"). In terms of an actor and a man, he is one of the most interesting, dynamic, intelligent, and personable individuals I've ever met. I was very impressed by him. George Lazenby ("Abandon Earth," "Escape to Earth") was probably the person I had the most fun with. He's one of the most naturally funny and charming people you'll ever meet. He has amazing grace and charm. What did it feel like when Superboy ended its production run? It was sad. I hate to say it, but when you work that closely with people on the set it's like you're married to all 110 of them. There was a sense of completion because we knew and anticipated the end of the show's production schedule. We were able to kind of set ourselves up for the end psychologically, and do things that we wanted to do, which was fun. But it was sad. We were all ticking down the days. We worked almost one continuous year with very few breaks. People feel burned out when they're working twelve hours a day, and often longer. We'd get all stressed out, but I'd tell people, "We're all going to miss this, don't forget it." Sure enough, it's all people talk about now. You wouldn't know it, but the behind-the-scenes aspects of the show were really nice. The staff and the production value was nice, the quality of the treatment of actors and people - all of that was of very high quality. There are a lot of personal relationships that will go on. Professionally it was the most incredible experience for me to work with a lot of older, famous actors, some wonderful directors, and to learn a lot, get a directing contract, and to write and end up producing the show. I got the full boat on that show - I was lucky. It was tough to leave it. Just that Adventures of Superman and George Reeves both had a great effect on me, and on the work I did in The Adventures of Superboy. And that's important. I'd say that Adventures of Superman had a great effect on everyone born since 1951. Yes, George Reeves portrayed a major, honest hero. And when you think of what people are watching today! Adventures of Superman was a big deal. Japanese Emperor Hirohito was a great fan of the show and used to send letters to George Reeves. It was done at a time in history when America was at a height. The show kind of fed all of that, there was so much going on. America was at the pinnacle of its strength in the world, those were interesting times. There's honesty in George Reeves' Superman. And strength tempered with humility. It's fun. A more complete version of this interview was originally published in The Adventures Continue #10, still available. Special thanks to Jim Nolt.